I had almost missed out on this post! Earlier last week, I had actually baked a Chocolate Cheesecake for my colleague. And because I gave it to her much earlier, I had completely forgotten about this chocolate cheesecake. I've asked her much earlier what kind of cake she would like. Her reply to me was "rich chocolate cake or cheesecake". So I thought, might as well have a chocolate cheesecake! 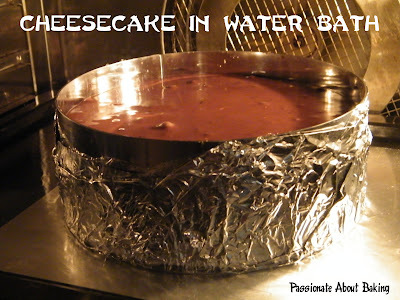 As it was the first time I was using this recipe to bake a chocolate cheesecake, I didn't know how it taste like. So I requested her to leave a tiny piece for me, if possible, for me to try it. This morning, the moment I stepped into the office, she told me, "your cheesecake is vv-ery, vv-ery...nice!" For a moment, I thought she wanted to tell me my cheesecake is not nice. I'm so glad she loved it! She had shared them with her siblings on Sunday. 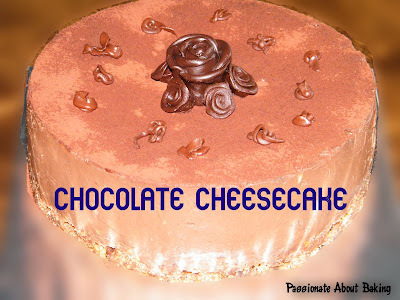 I tried the cheesecake, and true enough, it was really smooth, chocky and nice! This shall be a keeper for me! I was like quite free for a couple of Saturdays since my last Saturdays attending workshops. Actually, it was good to attend workshops so that I don't have to think about what to bake. Since now I'm free from attending workshops, I was looking for recipes to do some baking. Bread was first thing on my baking list since I've not been baking breads often. The last loaf I baked was rather good, so I intended to make it a weekly bake. 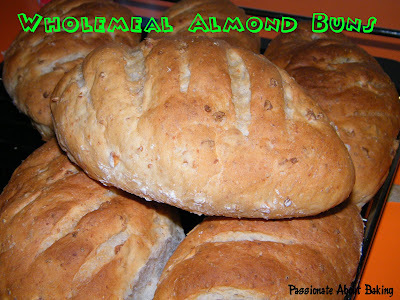 I baked some Wholemeal Almond Buns with modification from my course recipe. As I woke up very early on Saturday morning, I finished my bread by 10am. 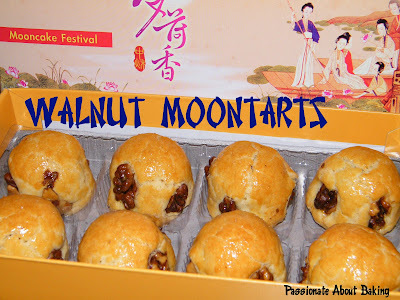 Then proceed on to bake Walnut Moontarts as I still have some white lotus paste left from my previous mooncake making. I managed to finish by lunch time, then after lunch, I continued to bake a cake as I was trying out a recipe for my new workshop. 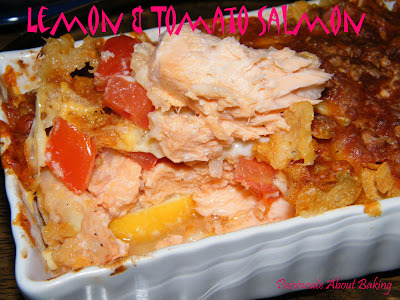 I read in some SHAPE magazine about Lemon & Garlic Salmon which seemed very easy to prepare and very healthy too! So I copied down the recipe in my handphone and tried to replicate the dish. I did this with some modification. 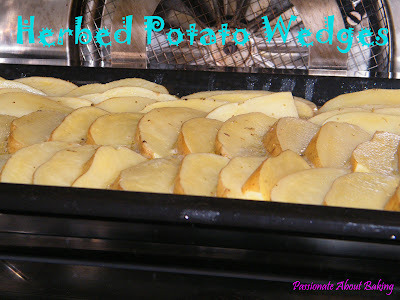 I also baked some herbed potato wedges which was also a sold-out for that evening! Of course, salad was also made to make the meal complete! 1. Remove skin from fish. 2. Marinate fish with lemon juice, salt and pepper at least 1 hour before. 3. 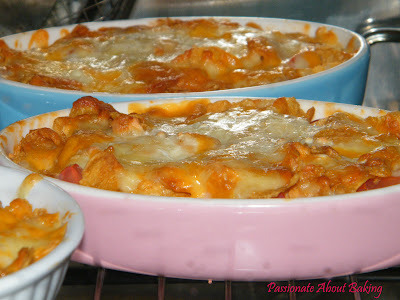 Place in a swallow oven proof dish. 4. 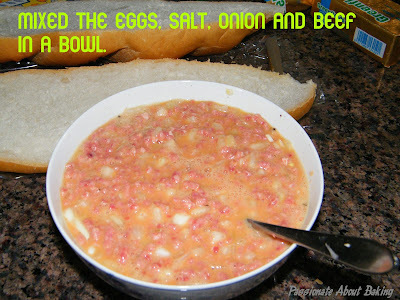 Top with garlic, onion and tomatoes. 6. Pour ketchup over the fish. 7. Spread cornflakes evenly over the fish, followed by cheese. 8. 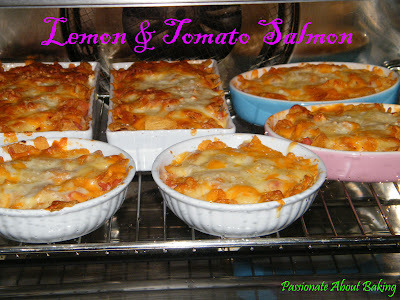 Bake in oven at 180C for 30mins or until fish flakes easily when tested with a fork. 9. Serve with green salad. It's been quite a while, almost like four months since I baked bread loaf. 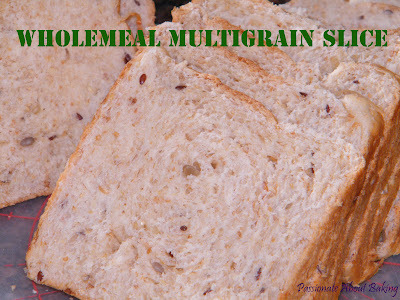 I've decided to use my multi-grains (realising I still left a lot after making muesli bar) for my bread. 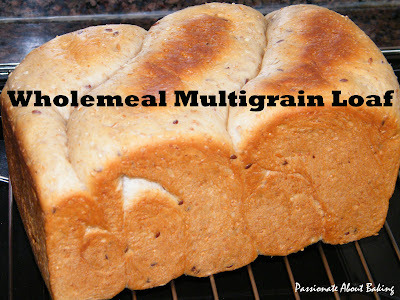 So I had to find a recipe that won't taste weird with multi-grains, but at the same time, I didn't wanted to make continental breads. Finally, I decided to try HBS's Honey Whole Wheat Loaf. 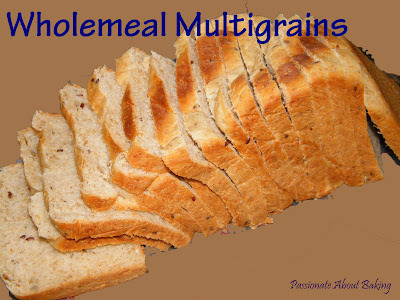 Besides adding wheat flour, I also added 40g of multi-grains to the ingredients and followed the rest of the ingredients exactly. This week, I baked quite a lot of stuffs. However, I didn't get the chance to post them up mainly because I was really busy, a bit of lazy too! 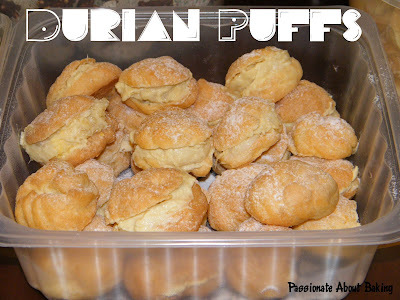 As my dad has a function on Sunday, he requested me to make the durian puffs again for his function. I made that last year and it was really very well received! As I have quite a lot of time on hand, I've decided to prepare more food for the function. 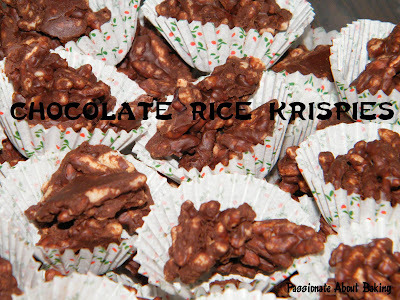 Besides durian puffs, I also made Chocolate Rice Krispies and Mini Apple Cinnamon Muffins. 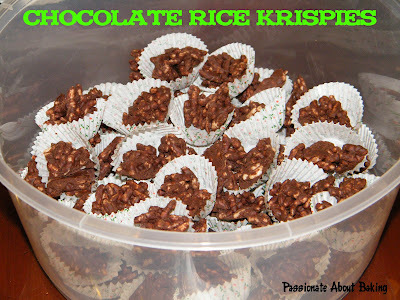 The Chocolate Rice Krispies wasn't very nice though as the rice krispies were a bit chewy. Fortunately the chocolate that was with it tasted good. So, there were no complaints. 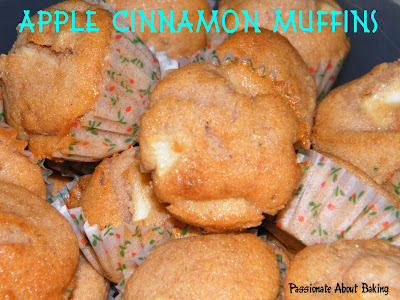 I've tried this muffin recipe previously and I used it again for Apple Cinnamon. 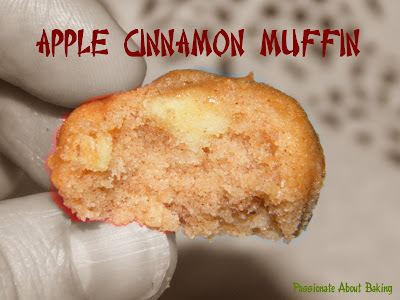 I remembered how I had my first apple cinnamon muffin from Muffin Break when I was in Melbourne more than a decade ago. To me, it was the most wonderful muffin I've ever had and from then on, it had become my favourite! 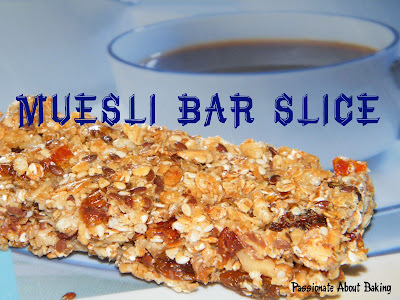 Lately, I've also been into muesli bars. Ever since my colleague gave me a muesli bar some weeks back, I've been waiting for these to be on sales at major supermarkets. Lately, I bought some Alpen and Carmen bars when they were on sales. 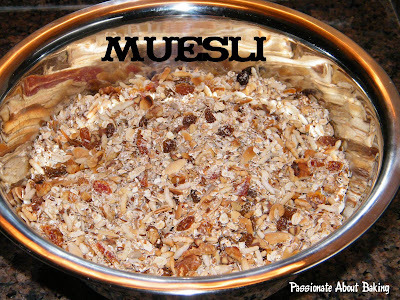 I also recalled that granolas given by my sister some weeks back were very similar to museli bars. 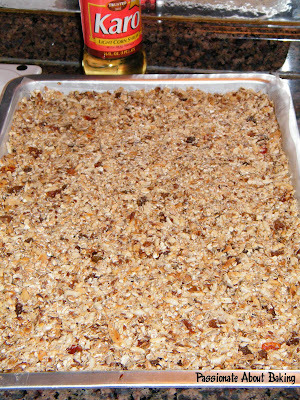 Therefore, I decided to make my own muesli bars! They can really be quite expensive, so I thought if I made them myself, then it should cost slightly less. Well, at least I can control what I want for the muesli. Boy, I was really glad I tried making it, it was really nice! 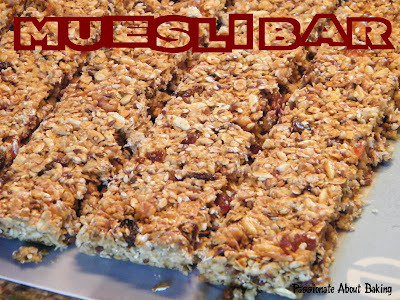 Recipe for Multi-grains & Fruits Muesli Bars. 1. Mix all the dry ingredients well. 2. Add in honey and light corn syrup, and mix well, like lumps. 3. 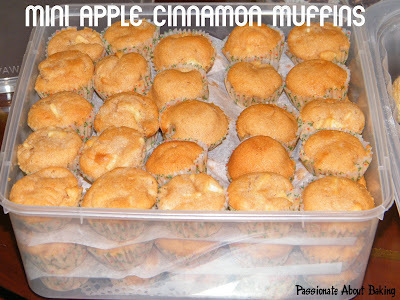 Pack them and arrange them on a tray, approx 14” x 8”, lined with baking paper. 4. Bake at 180C for about 15mins or until it turns brown. 5. Cooled, and sliced them according to preference. *Note: Ingredients are up to you to add. Just make sure there are a good mix of nuts and dried fruits to have a balance in taste! Okay, it's not true that I only bake on weekends. I'll do some bakings during the weekdays evenings too. Can't wait till weekend to touch the oven and the mixers! Being an impatient person I am, I like to get things done fast and efficient. My colleague ever told me that going window shopping with me is quite stressful because I walked rather fast. If nothing catches my eye, I'll just zoomed by them without stopping even to browse. But I can't say the same when I'm in Daiso. Everything there just made me stop to see and touch. Anyway, the fragrance was really nice as it included orange zest. 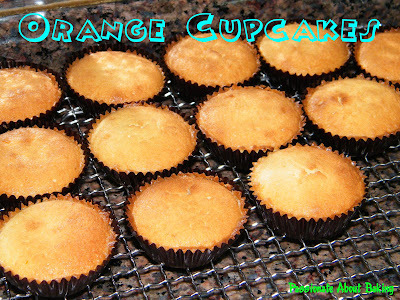 I just love that orange citrus smell and taste. I've decided to "throw in" some ganache so as not to make it too plain. We all love roses because of its gorgeous beauty, colour and fragrance. Rose is perennial favourite. Many cake decorators like to use roses to decorate their cakes especially for wedding cakes! It is loved by all ages alike. 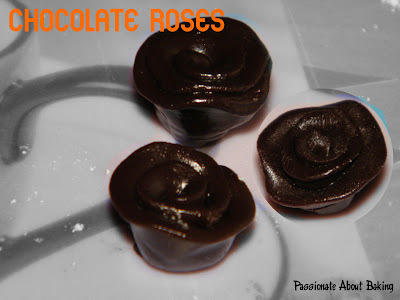 Now, you can learn to make roses using different types of sugar paste for your cake decoration. Transform a simple cake, into an impressive cake with your modelling roses! The best part is, no complicated tools are used! Register with Jane @ aloyallyanders@gmail.com by 10 October 2009. Payment is made via internet transfers to POSB Savings account 017261398. Confirmation will be given once payment is received. 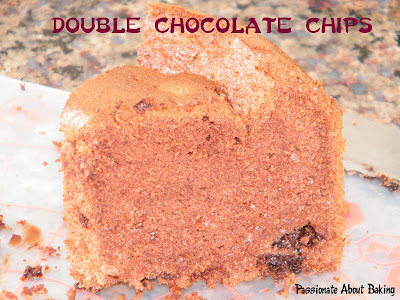 Double Cs stands for Chocolate Chips Chiffon. Okay, with a cake too! I was up early on Sunday morning and I decided to do a "quick" bake. I quickly pulled out my file on "First priority to bake" and drew out the recipe on Double Chocolate Chiffon Cake from Rei's blog. I've always like chiffon cakes, and chocolates. So chocolate chips chiffon cake just sound too tempting for me not to try at all! 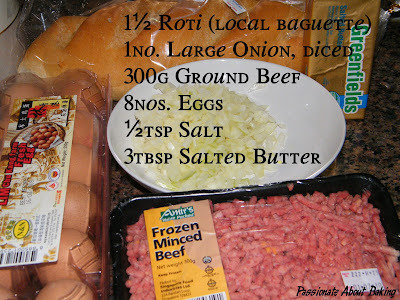 So I quickly "whipped" up the ingredients and put to bake before I prepare myself for my workshop. The last time I baked this wasn't that successful. Unfortunately, this time also wasn't too good. It was mainly due to my chocolate chips which were too thick. I must have threw them in too fast and too hard, they just stayed in the bottom of the pan, unlike Rei's! But nevertheless, the taste of the chocolate cake was really good! 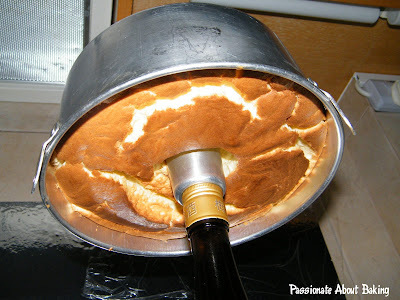 Maybe I can consider using this as a soft sponge cake...anyway, mine looked like one too! 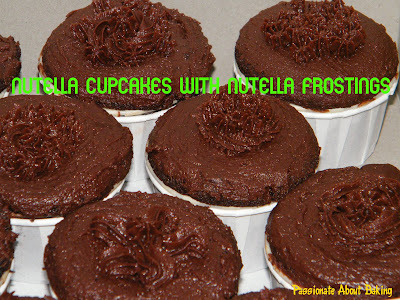 This week started with an order of Nutella cupcakes for my colleague, and some simple bakes. In fact, there was a variety of bakes - cupcakes, buns, cake and macarons! My colleague bought a small tub of Nutella previously and I volunteered to bake Nutella cupcakes for her, and used up the whole tub! Then as I was on half day leave on Wednesday afternoon to pack my printed recipes etc, I already baked some sweet buns I learnt from my previous California Style Baking. 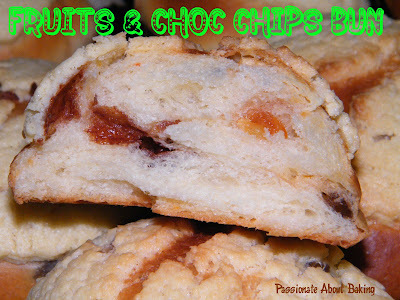 Instead of adding mixed cherries to the dough, I added raisins, orange peels and dried tomatoes, and chocolate chips. Then topped it with some sweet pastry dough. The overall taste was rather good, but the bread wasn't soft was expected. 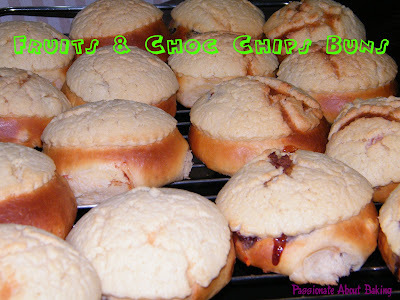 Luckily the sweet pastry top masked out the toughness of the buns! 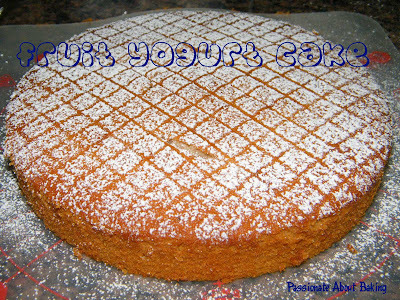 Feeling like baking some yogurt cake, I decided to try Sugar Inc's Strawberry Yogurt Cake. This was from her freebies page (provided you sign up for her newsletter). 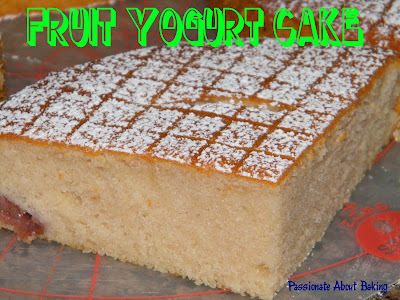 However, instead of using strawberry, I used a mixed fruit yogurt. The cake turned out to be a tad too sweet for me. Maybe it was because I was using a normal yogurt rather than a low fat one. However, my colleagues liked them and so do my hb! 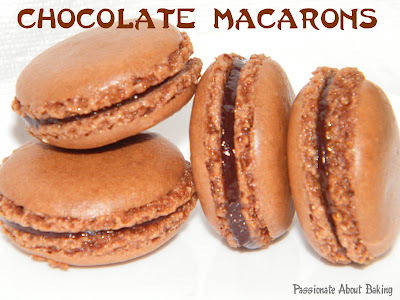 Finally, I decided to try a macaron recipe from this site where my friend sent it to me. I'm so glad that I heed her advice to try this. I was really thrilled when the feet showed up, but followed by cracks at the top. Then I realised I've placed my rack too high up, causing it to crack so terribly. The second batch was better. At least, most of them were nice and smooth. This recipe will be a keeper for me. 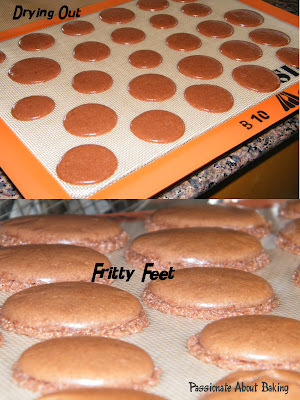 And since I've got myself new silpat mats all the more, I will bake more macarons! The last last continental bread had been delayed in posting up. Mainly because last week I was still busy baking and doing some other stuff (??). 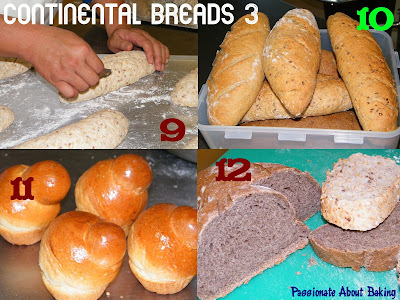 Finally, my last workshop on Continental Breads was on last Saturday. It was rather tiring since I had been attending workshops since April starting with the Cake Decoration. Though the stressful courses were over, there was still a commitment to go for the weekly course. Well, maybe I asked for it. It can be quite tiring too! I cannot imagine those who signed up for part-time nitec baking courses when they have to attend twice weekly for six months. Guess it must really be tiring and stressful!! Anyway, for the third lesson, we did Buckwheat and Rye breads. According to Chef Low, Buckwheat is good for those with high blood pressure, though it really doesn't taste that good! From Wikipedia:"...Buckwheat contains rutin, a medicinal chemical that strengthens capillary walls, reducing hemorrhaging in people with high blood pressure...". It does sounds good. Like what Chef Low said, food that is good, is not popular, food that is not very good, is very popular. That's rather true! 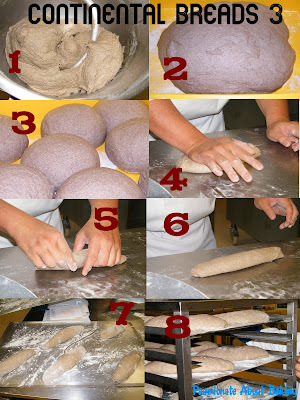 These were the steps in producing Buckwheat and Rye and multigrains breads. 1. Mixing the ingredients to form a dough. 3. Cut & divide, then 2nd floor time. 4. Shaping it. Roll it out, then fold it in and punch down. 7. 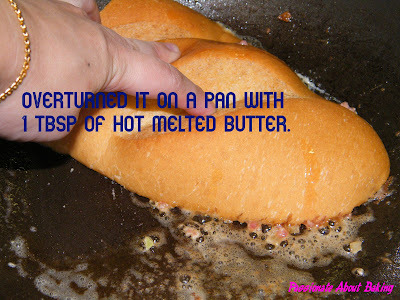 Grease the tray and let it to proof. 9. Scoring the top of Multigrain rye bread. 10. A mixture of breads for us to bring back. 11. Brioche was given to us to try in class. Yummy. 12. Cross section of the Buckwheat bread and the multigrain rye bread. Continental Breads 4 - Onion bread and Walnut bread. 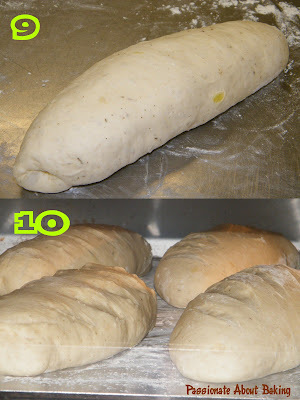 On our last lesson, these were what we did - Onion bread and Walnut bread. What we did in class is usually, half the class do the Onion bread, the other half do the Walnut bread. Then we divide and share our breads. 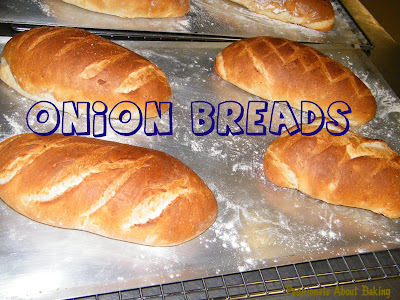 I chose to do the onion bread as I simply love onions. 1. Chef Low sauted the onions for us. 2. Beat the dough until it has the "por-por" sound. 3. Showing the thin membrane stage. 4. Onion bread dough having its 1st proof. 5. Walnut bread dough having its 1st proof. 6. Beating out the dough after 1st proof. 7. 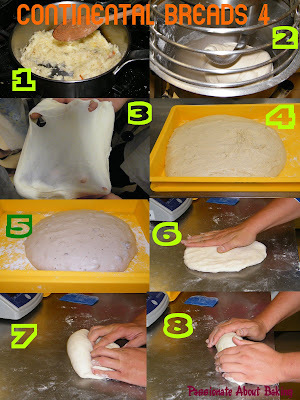 Folding in the dough and pressing it down. 8. Then shaping it nice for proofing. Sharing a video on the mixing of the dough. Listen to the sound of the dough as it is getting ready for the membrane stage, and cleaning up the mixing bowl. 9. Leaving it to final proof. 10. Scoring the top and baking it! Finally, the baked, wonderfully smelled Onion Breads! Yummy! Lastly, I just want to add that I really had a good and wonderful time learning together with Doris, Zainah & Suryani! They have truly been a great companion during the past few months. I will miss them dearly! Thank you Zai, for your mooncakes, Su for your lovely customised pencil and Doris... for all your company, knowledge and your critics! Hope to see you pals again! I bought some strawberries last week and found that they were really sour! I knew nobody would wanted to eat those, including myself. So I've decided that I shall bake a cake sheet, then turned it into swiss rolls. I mixed the strawberries with the frozen blueberries and cooked them with sugar to form berries sauce for the swiss rolls. 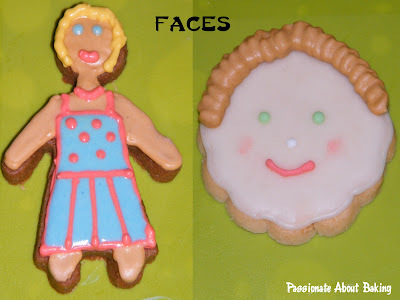 Last month, I appeal for my sales of cookies to help a friend. I just want to thank my family, friends, colleagues and even strangers for being so generously helping me to achieve my objective. I'm so happy that I managed to raise >S$1,000 for my friend, Cally. I've already passed her the money. Some bought cookies generously, others donated cash generously. Initially, I wanted to list their names, but I thought through, maybe I'll just leave them "alone" since they have already been kind enough to help. They know who they are. I'm just so grateful to them. I'm sure Cally and Alan would be touched by their kind gestures too! Thank you to all of you! "Today Alan turned his head slightly again & he managed to follow my instruction to grasp my hand with his left hand & relax. He did it twice. Good progress indeed. I also found a 3 mths contract job with RBS & will be starting next wed. Income for the family again." Continue to include this family in your prayers! I bought this Yuzu 柚子 concentrate paste from Kitchen Capers since May, and I've not used it now! Actually, using it now is also finding an excuse, otherwise, I don't know when I'll use it! I remembered seeing from Gina's blog about her post on the chiffon. But somehow, I couldn't find it, only to realise, I've seen wrongly! :p It was actually UME Plum Chiffon Cake. 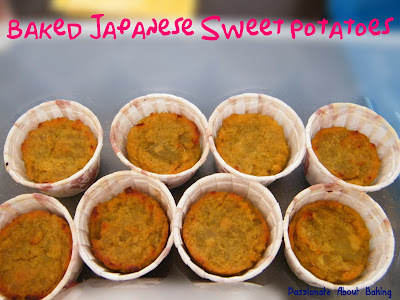 So instead of using UME Plum, I replaced the recipe with Yuzu. I loved the smell of the Yuzu (citrus fruit). 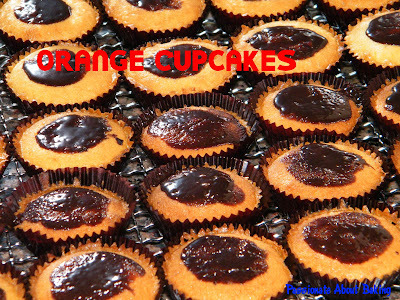 When it was baking in the oven, the nice citrus smell that filled the air just made me swallowed my saliva! You know how those sour sour smell that you get sometimes just made you swallowed your saliva for no reason? Well, this is it! I tweaked the recipe a little, and found that it didn't turned out to be a perfect chiffon. However, I would say it's really nice and soft, very suitable to be a sponge cake. 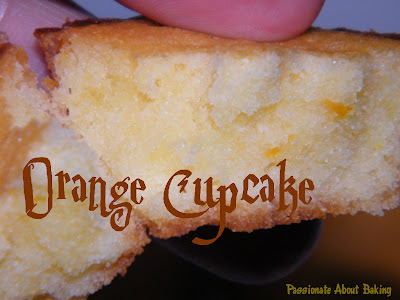 I think I'll use this exact recipe to bake a sponge cake in future! 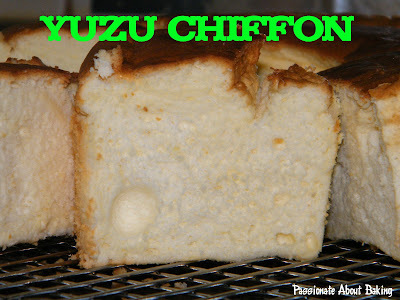 Recipe for Yuzu Chiffon Cake, modified from Taste of Time. 1. In a mixing bowl, add egg yolks to whip till well mixed. 2. 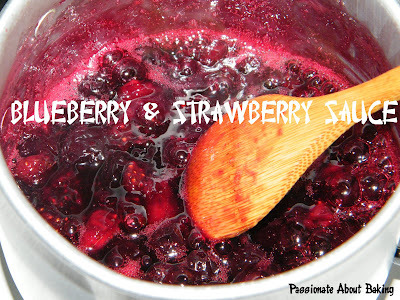 Add milk, fruit paste to stir. Then add flour and stir to mix evenly. Set aside. 3. Whip egg whites and cream of tartar in a mixer till foamy. Then pour in sugar slowly. 4. Whip till it peaks. Then fold in egg yolk batter with it. 5. Pour into tube pan. I used 8" which was too big. 6" tube pan should be just nice for it to rise highly. 6. Bake in preheated oven 160C for 35 mins. You can get Yuzu concentrate paste from Kitchen Capers store. The following day, I decided not to do any bakings. 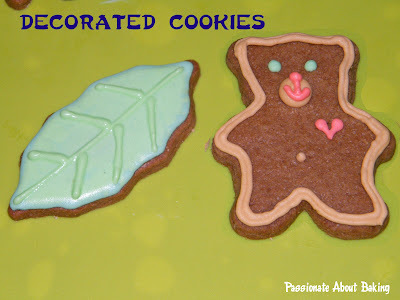 Instead, I decorated some cookies to practice my skills! 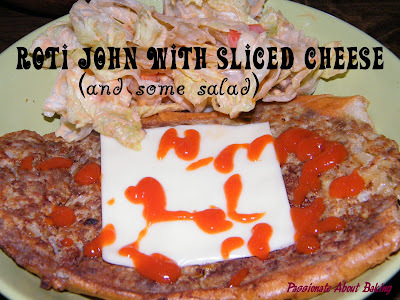 Roti John or Loti John? 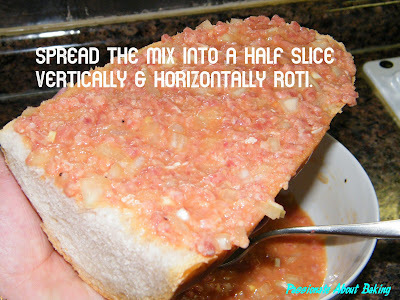 I've always loved anything roti aka loti. My dear colleague, Jolene, lately made some roti john for her dinner and brought some for me the following day. She usually shares some with me because she knew I like them. Heehee...Maybe both of us are very easy-going and don't mind trying each other's food, so she will share some with me sometimes, especially those dishes which I showed vast interest in! 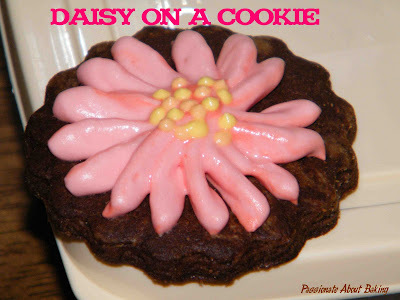 She was very kind to share with me the recipe and how to make. I just can't wait to try it. Finally, I got a chance to do it today since childcare centre is closed, and I'm with the kids. Earlier in the day, I brought the kids out to Bird Park, followed by window shopping in ION Orchard. Then came home to prepare Roti John for dinner. It was really simple like what she has taught me. 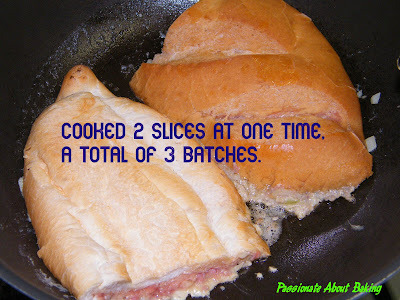 I'm sharing the recipe here with you. All thanks to Jolene! Served with sliced cheese and chilli sauce. This was exceptionally good! Some pictures I've taken today. It was quite fun playing with the different modes of the camera. 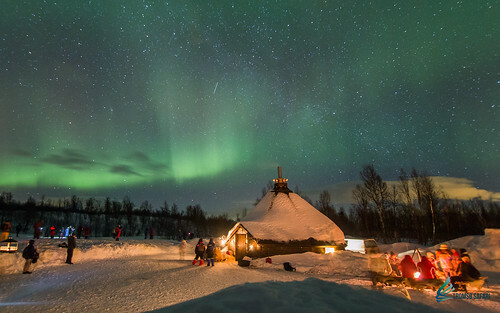 Can anyone guess where and how was this taken?